Senate Majority Leader Mitch McConnell is expected to call up legislation that advances a proposal from President Trump to reopen the federal government in addition to authorizing billions of dollars for a border wall and instituting a policy that would significantly restrict asylum for children from Central America. At first glance, the administration’s plan appears to restore an Obama-era program when the U.S. government recognized that children were fleeing their home countries of El Salvador, Honduras, and Guatemala to escape gang violence, gang recruitment, and horrific violent crimes against women and young girls. This program for Central American minors (CAM) created a legal pathway to protect children from smugglers and traffickers that preyed on their vulnerability during the dangerous trek to the United States. But the Trump administration rescinded this program in 2017. 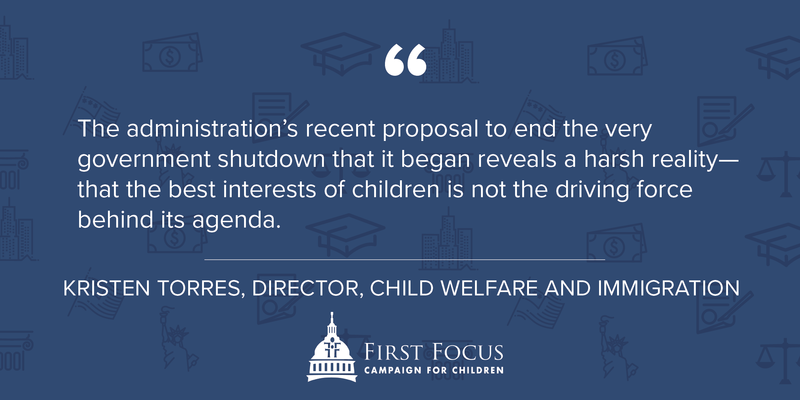 Unfortunately, the 3-year program in the proposed spending bill differs drastically from the original CAM program. Instead it serves as a deterrent for asylum seekers rather than an additional form of support for vulnerable children. The proposal would effectively ban asylum for minors who apply at the U.S. border and for those who do not meet the new eligibility requirement of having a “qualified parent or guardian” already living in the United States. In addition to the new requirements for eligibility, the logistics of the program include limiting application approvals to 15,000 per year, imposing a fee to cover the cost of the application, and shifting the burden of applying for asylum onto traumatized children. According to Gregory Chen of the American Immigration Lawyers Association (AILA), the program isn’t slated to be operational for nearly a year (240 days) after the bill’s enactment, but these minors are immediately excluded from asylum at the border. Alarmingly, this proposal also guts protections for unaccompanied children in the Trafficking Victims Protection Reauthorization Act of 2008 (TVPRA) to allow for the deportation of minors to both contiguous and non-contiguous countries without judicial review. This means that children presenting themselves at the border to seek refuge would be denied the ability to have their case heard by an immigration judge and expeditiously sent back into the dangerous situations from which they were fleeing. Trump has used the plight of Central American children to advance his anti-immigrant agenda. On multiple occasions, he expressed a desire to keep immigrant and refugee children safe through closing “legal loopholes.” Ultimately, the administration’s recent proposal to end the very government shutdown that it began reveals a harsh reality—that the best interests of children is not the driving force behind its agenda.